Another example of the “Butterfly Effect” is discovered in the Book of Exodus. The reading for this morning begins on a chilling note. Here, we are told that a new king arose over Egypt, one “who did not know Joseph”. By the time today’s story begins, Joseph, who served as Prime Minister of Egypt, has long since departed and this new king who arrives on the scene lacks the historical perspective that would help him to know that the Hebrews have been given the land of Goshen by a previous pharaoh, and were considered allies and honored guests of Egypt. Instead, what this new king sees is that the Hebrews are multiplying in number, and as they increase, he perceives a threat. If you think about it, that’s a story that has cycled through history many times. A ruler seeks to solidify a political base—and in doing so—looks around for a convenient scapegoat. In many places throughout the world from Spain to Portugal to Germany, Italy and the United States, it has been the Jews. Over the course of American history it has been (at various times) the Irish, the Germans, Black people, Yankee Carpet Baggers, illegal immigrants, welfare moms, gays, the “undeserving” poor and Muslims. So, what Pharaoh was doing—was something done by many rulers throughout the world, sadly, even unto our own day. And so, the Hebrew people are enslaved and put to hard labor. Even so, God continues to increase their number, and Pharaoh goes from being angry to turning murderous and orders the Hebrew midwives, Shiphrah and Puah, to kill all the baby boys that are born to Hebrew mothers. And….they do not. These two remarkable women (and notice, that they are named in the Bible). Shiphrah and Puah—they engage in an act of civil disobedience and concoct a lie to explain the continued existence of these baby boys saying: “Ah, these Hebrew women—they are so strong and vigorous (hint---unlike Egyptian women)—they give birth to their babies before we arrive. What can we do?” At which point, Pharaoh commands his people to drown the baby boys in the river Nile. And now, more women come to the scene to defy the order of a murderous monarch. Who are they? Certainly the midwives, but also the mother of a baby, who will eventually be named Moses, his sister, Pharaoh’s own daughter and her ladies in waiting. Notice, they are all women—and notice, also, these women come from all stratas of society from the lowest of the low—the slaves, to the daughter of Pharaoh himself—think of this as one of the first recorded feminist conspiracies in history. And, it’s right here in the Bible! The mother of Moses gives birth to her son, she places him in a basket and strategically places that basket (and Moses’ sister) in a place where he will be discovered by someone who has the power, and hopefully, the conscience, to save him. 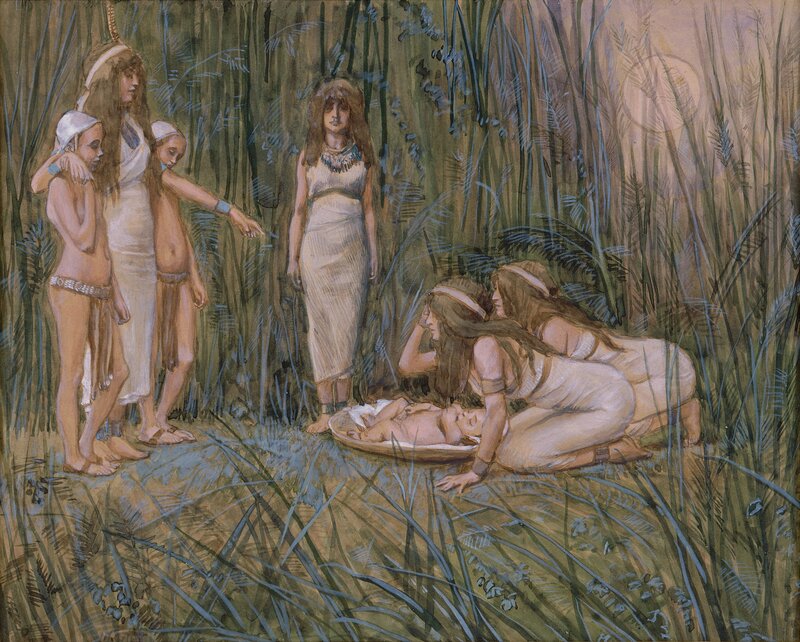 The scheme works—Pharaoh’s daughter is a willing participant (as are her ladies in waiting), and—what’s more—at the urging of Moses’ sister, she turns around and hires Moses’ own mother to raise her son! Absolutely remarkable—especially when one pauses to consider the consequences should any of them be caught. Consider the choices that were made. I doubt that any of these women thought that they were making decisions which would, in the course of history, free the Hebrew people from enslavement, lead them into the Promised Land, and ultimately grant us all the blessing of the Messiah. Instead, they were simply doing what they believed was right. They were being faithful by following the call of conscience. They made small, courageous decisions and followed their heart—and thereby all of them—both Jew and Pagan, were heeding God’s call. I’m reminded of a story of someone who had come face-to-face with a large crisis asking why God didn’t send someone to make things better. And a person replied—it seems to me that God sent you. Just as the Shiprah, Puah, the Mother of Moses, his sister, Pharaoh’s daughter and her ladies in waiting were agents of God, so are we. Today’s story is a reminder to us that when we see something wrong in the world; something that causes our conscience to cry out—we are to respond. Consider the week ahead of you. Imagine, what you do—this day, and in the days ahead of you, has the capacity to change history and the world. You may be tempted to think that you are one person in a world gone awry; reasoning “what can I possibly do to effect any meaningful change”. Yet, you can do something—and whatever that something is—bear this in mind—it is very, very important that you do it. In Jesus’ name. Amen.